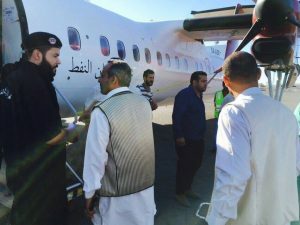 Eleven of those who were seriously injured in Tripoli earlier this week when a rocket-propelled grenade exploded beside them near Mitiga airport have been air ambulanced to Tunis today for treatment. They comprise four children, four women and three men. According to the health ministry in the Presidency Council’s government of national accord which organised the flight, the final casualty list from the RPG attack was five dead – all from the same family – and 32 injured. Heavy clashes broke out between rivals within the Buni Brigade, which at the time controlled Mitiga airport terminal. It has now been broken up and many of its members arrested by Abdul Rauf Kara’s Rada Special Deterrence Force – or the Special Support Force as it now calls itself.